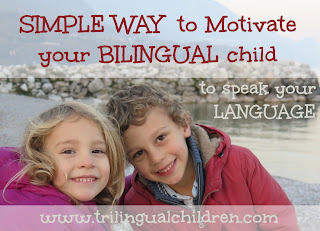 Google+ Raising a Trilingual Child: Simple way to motivate your bilingual child to speak your language. When our family started the trilingual journey more than 6 years ago, I had no idea if I would succeed in passing my mother tongue onto my two children. I simply launched myself into this adventure. Now my kids are 4 and 6 years old and can speak, read and write in Russian, my mother tongue. I can not believe that I did all this work by myself. I set a goal - the maximum fluency level my children can possibly reach - and I went for it. What is the recipe you might ask? as for the rest - just give your child what he enjoys the most and what he is interested in. Give it all in the minority language! What babies like is exactly what they need for starting learning the language you speak. They need face to face contact, mommy’s and daddy’s smiles, baby talk. Talk to your baby all the time. Use simple sentences. Point to things and name them. Read my article "Bilingualism and Speech Delay. How can you help? for more insights on this topic. What do toddlers like? - They like being with their parents, play, sing, read books, draw and move. The are full of energy. You just need to direct it a way that works best for language learning and vocabulary development. Incorporate teaching into play. It is not as difficult as it sounds. Do not associate word “teaching” here with a class room settings. Remember that at this age kids learn well while moving. Turn on a song or sing yourself. I am sure you have something similar to the English “head shoulders knees and toes” song. If not you can make up your own! Here is how we had fun with the Russian “Wind is blowing in the face”. Add more words when describing an object to your child. If he makes a mistake, correct it indirectly by simply rephrasing, repeating what the baby says. Read as much as you can during this period. Select books on different subjects. Your Toddler Doesn't Like to Read? article. Teach letter sounds, too, especially, if you’d like your child to be literate in your language. Watch this Video by Floating University lecture, Professor Steven Pinker , who is talking about the nature of language acquisition in children. 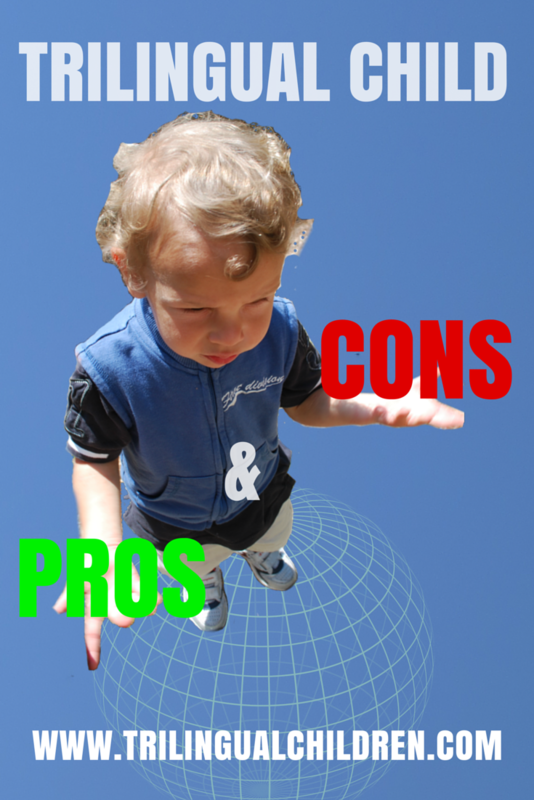 What does a preschooler want? Same as a toddler, but now he is ready to play with friends. 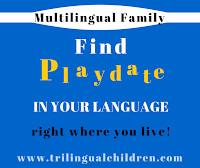 It would be great, if you could find a friend for your child that can also speak your minority language. My kids play with each other speaking their minority language only. They often sing songs in other languages, but speak Russian all the time no matter who is around them. Read about 7 facts that can determine the language spoken between multilingual siblings. What do first graders like? - school experience is very new to them. They love writing in a pretty notebooks with pretty pan and pencils. Just use this opportunity to start a new routine. Get a notebook for your home language and “play school” at home. My kids both 4 and 6 years old have a notebook for Russian, where they write stories, short and simple dictations. I take whatever they covered at school and use it as a base for our fun lessons. Yes, I invent lessons myself. It is not very difficult. These lessons do not have to be long. Write notes to each other, shopping lists. Read more books about animals, adventure. Magazines and interactive games are something they are interested in. Have them available for your child in your language. Travel, visit museums. Talk about things you see and experience together. I am not quite there yet with my kids. I will add more details later. Right now I can only assume, that they would like to spend even more time with the friends. Watch TV. I would watch together some news in the minority language on TV or online. They will probably already have a cell phone - it is a good idea to send messages to each other in your minority language. If kids have hard time reading books, perhaps having Comics around the house could trigger kids interest in books. This is a difficult period for many parents as I hear. Do you already have tweens and teens? I would be happy to add your comments here! What do they enjoy? One parent speaks two languages. 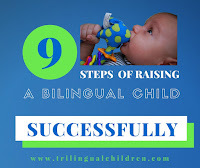 Raising a trilingual child. Would you like to receive Tips and Updates from us? Really helpful to split up the ideas per age group! And wow, if Patricia's talk isn't a motivation not to underestimate a non-talker, I don't know what is! Thank you for stopping by! Yes, Patricia's talk sheds light on this topic.